Of course, I know that an author with KDP can set a future release date but these early releases do not accumulate actual sales (although future sales have value in Amazon's algorithm) and can submit literary reviews through Author Central but Amazon does not allow a reader to post a review on something that has not been published yet. How can Amazon get away with this? Are certain publishers buying them off so they can get around the rules? Of course, my conspiracy theory prone mind took over and I began thinking of all kinds of diabolical schemes designed to keep me from becoming the breakout indie sensation I so richly deserve to be. Here's a screenshot of the top ten kindle books I saw. How odd that the top six kindle books have a release date of 1 January 2019! Hmm, if this is so, then how did these books get reviews and ratings in the top ten an entire month before the release date? How are these particular authors and publishers able to break the rules set forth by Amazon and get away with it? A deeper investigation down the list of top one hundred books revealed that they were from a select group of publishers, all of which were unfamiliar to me. 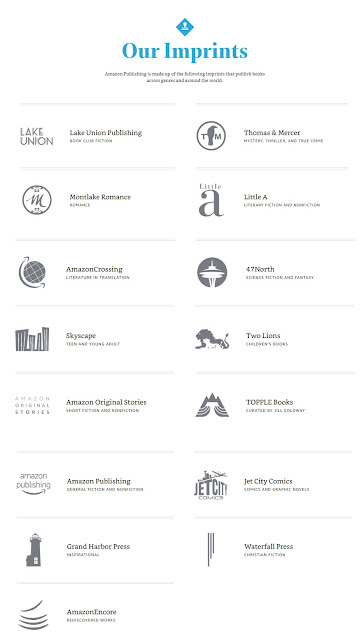 Publishers like Lake Union Publishing, Thomas & Mercer, Montlake Romance, and 47 North. Since I grew up around the Seattle area of Washington State, these names sounded vaguely familiar to me. I soon realized that many of them were places or things associated with the Seattle area. A still deeper investigation revealed that these publishers were all imprints of Amazon! So, apparently, Amazon runs a bunch of their own publishing houses and then sets their books up for success by creating a separate set of rules and algorithms for them. It DOES seem just a little unfair to me. On the other hand, independent authors know all about the practices of Amazon and but realize that Amazon was at the forefront of providing this platform for indie authors. I personally still like that indie authors still gain more percentage of book price in royalties than any other platform except maybe Smashwords. They also provided a go-around to traditional publishing with its gatekeepers and poor treatment of new authors. This is something I've contemplated quite a bit. I have many author friends that believe traditional publishing is the way to go and if one is not traditionally published they are not an author to be taken seriously. I say poo poo on that though. the few author friends I know that did manage to get a contract with a major publishing house have had very mixed results. On the upside, they were provided with editing and, in some cases, were allowed input on things like cover art but, once the book was published, they quickly became more like an independent author in that they were expected to provide their own marketing and other authorly things like arranging book signings. So, in this sense, these Amazon imprints are, in the very least, providing their new authors with a bit of a leg up at a most critical time for an author -- the days, weeks and months leading to the release date. So, while I still think it is unfair that Amazon chooses to provide an advantage to their own imprints, I also realize that this is what Amazon is. Amazon is this behemoth because of their predatory practices, arcane and domineering treatment of independent authors (KDP Select) and questionable business scruples. Nonetheless, they do provide the indie author with options to gain some remuneration for their work outside of forming one's own publishing company as many authors of the past. Might I also point out that I still found many independent authors within the top one hundred sellers on this list. One independent author, Alexa Riley, had three stories in the top one hundred at the time of my viewing and that's not too shabby. What are your thoughts on Amazon KDP and Amazon imprints? Any other indie authors out there with a personal experience?